The first of author Tom Clancy’s bestselling military/political novels to be adapted for the big screen, director John McTiernan’s The Hunt for Red October should feel a lot more dated than it does. Though it was released in 1990, the film is very much a product of the 1980s with its tense Cold War tone and its old school use of editing, staging, and cinematography to create drama. It stars a young Alec Baldwin as CIA analyst Jack Ryan, a role for which Harrison Ford would later became synonymous. But while this is definitely a naval action film, Ryan is no action hero. Were it remade today, the impulse would be to turn Ryan into a Jason Bourne or an Ethan Hunt. Baldwin’s Ryan is uncomfortable and out of his element through the whole story, yet he brings an insight that makes the difference in key moments. This in turn allows every member of the film’s ensemble cast to shine, including the likes of Scott Glenn, James Early Jones, Sam Neill, Fred Dalton Thompson, Jeffrey Jones, and Stellan Skarsgård. But it’s the great Sean Connery who breathes energy into these proceedings. The plot is straightforward: The Soviet Union has developed a new kind of submarine propulsion system, a super-quiet “caterpillar” drive that could shift the international balance of power. The honor of taking out the first boomer equipped with this drive, the Red October, has fallen to veteran Captain Marko Ramius (Connery). But Ramius has an agenda of his own – he means to defect and to deliver the sub, which he knows to be a dangerous first strike weapon, into American hands. Realizing this, the Russians send their entire naval fleet to stop him, alarming American and NATO forces. Tensions are high and war appears imminent, but Ryan alone suspects Ramius’ real intentions. So he’s sent on an edge-of-his-seat mission to find Ramius first and help him achieve his goal. The Hunt for Red October was shot on 35mm film using Panavision cameras with anamorphic lenses and was finished on film. For its Ultra HD release, the film was scanned in full native 4K and given a high dynamic range color grade (in HDR10 and Dolby Vision). It’s presented here at the proper 2.35:1 theatrical aspect ratio. It’s important to note that this is a dark film – much of it takes place underwater, after all, and in dimly-lit control rooms and cockpits. McTiernan and cinematographer Jan de Bont also use extensive on set atmospherics to create a greater sense of space and depth within the frame. So the film has always looked a little soft. But the native 4K scan adds notable refinement to its overall image detail, grain, and surface textures. The HDR deepens the darkest areas of the frame, but brightens the highlights too, adding a measure of greater realism to both the control room settings and even the underwater environments. There’s also subtly greater nuance in the film’s color palette, which is a bit muted by design. This is not a 4K transfer that’s likely to please the eye candy “buckaroos,” but longtime fans of this film should be quite pleased. 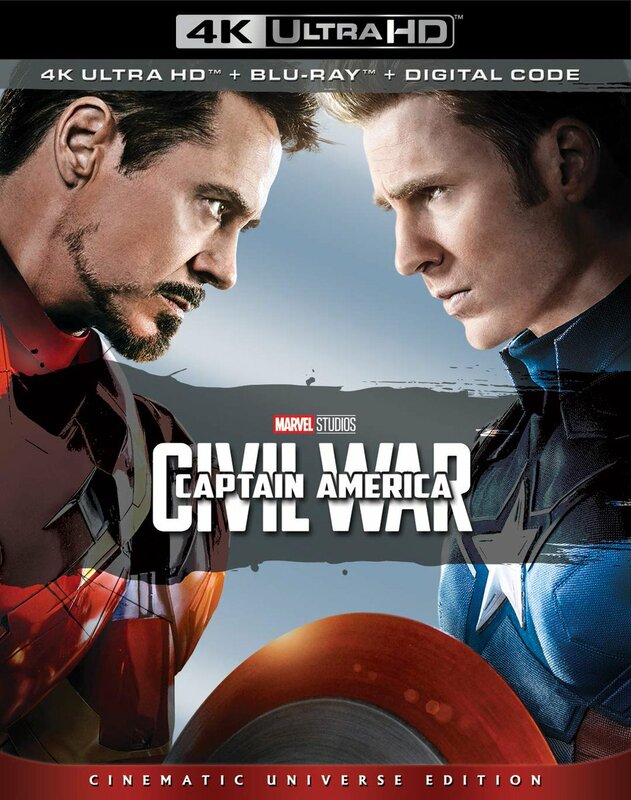 In terms of audio, the 4K Ultra HD disc includes the exact same lossless English 5.1 Dolby TrueHD surround mix that was found on the previous Blu-ray edition. That’s fine, because that mix was and remains quite solid. It has a big wide soundstage, plenty of subtle (and not so subtle) ambient cues, and firm, robust low end. Panning is lively and smooth, dialogue is clean, and the fidelity of the score is lovely, filled as it is with stirring choral arrangements. When the mix needs to deliver a little bit of directional thrill, for example in the climactic sub battle and the exchange of gunfire in the bowels of Red October, it does so with workmanlike efficiency. Additional audio options on the 4K disc include English Audio Description, 5.1 Dolby Digital in German, Spanish, Latin Spanish, French, and Italian, along with Japanese 2.0 Dolby Digital, and Portuguese mono. There are also optional subtitles available in twenty different languages, including English and English for the Hearing Impaired. As you’d expect, there’s also a Digital Copy code on a paper insert in the packaging. The Hunt for Red October is just a great military, political, and spy thriller. This is no-frills filmmaking, yet it works perfectly because everyone involved delivers at the very top of their game. I wish Hollywood made more movies like it these days. 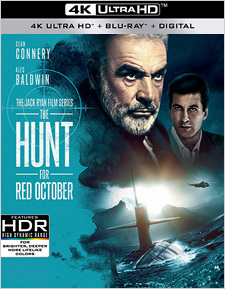 Those 4K fanatics chasing pure A/V thrills will probably be underwhelmed, but those who know and love Red October best will be happy indeed with this upgrade.